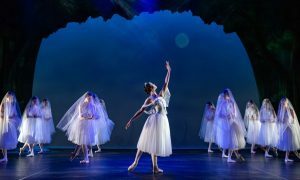 With the Australian Ballet we come to expect perfection, and on the opening night of Nutcracker, it was somewhat of a surprise to see that the company did not quite live up to its standard. Perhaps it was opening night jitters, a lack of rehearsal or unavoidable cast changes, but there were several slips and stumbles, an array of awkward casting heights and even the orchestra under Ormsby Wilkins sounded rather lackluster in interpretation and dynamics. Nutcracker, as a ballet, should immerse the audience into the enchanting, magical imagery and fabrication of the fairytale. Peter Wright’s version of this ballet, I feel, lacked the wonder, allure and anticipation of other great Nutcrackers. The “ooohs and ahhhs” that are synonymous with wonderful costumes, glittering sets and magical moments failed to present themselves – to the point that when one did occur the audience did not respond. Too many gratuitous characters hampered the opening scene in ‘Dr Stahibaum’s’ house as the odd shape of the set, along with the Christmas tree, furnishings, staircase and all the family and guests restricted the available space for the dancers. This was evidenced when Kevin Jackson, who was robust as the lead cadet, with his fellow trainees were hindered by the restricted stage area available. Madeleine Eastoe was fantastic as the young ‘Clara’. She looked like a 16 year old but danced with the technical proficiency and artistry that defined her captivating interpretation. She had a wonderful girlish quality that made one double check the cast list to make sure it was in fact her. She was perfectly cast. Damian Welch is developing as a character actor but lacked the substance or fascination for ‘Drosselmeyer’ and apart from the pyrotechnics, the magic really did not work either. His attendant Matthew Donnelly was far more convincing in his role as the magician’s assistant. Frank Leo was also well cast in his role as the butler. Juliet Burnett’s stunning legs and feet were highlighted as the ‘Columbine Doll’. Ben Davis as the ‘Harlequin’ and Tzu-Chao Chou as the ‘Jack-in-the-Box’ were proficient in their roles. Laura Tong captured the dignity and maturity as Clara’s mother, but Jarryd Madden as the father looked and acted far too immature for this role. Colin Peasley as the Grandfather epitomized the true essence of a character dancer and although his role was brief, we finally relaxed into the true ambience of his magic on stage. Audrey Nicholls was the ideal Grandmother assisting Peasley with humour and dignity. The transformation scene where the Christmas tree grew to gargantuan proportions delighting children, the audience and I, was superb, and a real piece of fantasy. The entrance of the soldiers via the wooden box delivered the toy-like innuendo that it intended and the scene was capped off with some very athletic mice in the most preeminent mouse costumes ever! The fight scene was quite enthralling as the soldiers and the mice battled it out with Clara saving the day by defending her ‘Nutcracker’ (Kevin Jackson) and hitting the ‘Mouse King’ (Andrew Wright) over the head. Adam Bull (standing in for an injured Robert Curran) emerged as the ‘Nutcracker Prince’ and he was superlative in this role. He was elegant, charismatic and of true noble character. His assured turns, elevation and attention to detail are evidence of good training. Although the height difference between Eastoe and Bull was apparent, they danced as assuredly and composed as any. 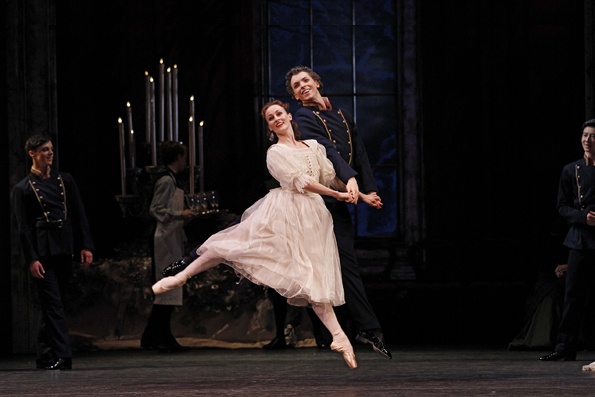 Their first pas de deux was elating and Eastoe’s joy of dancing with her transformed Nutcracker was evident. Into the land of the snow automatically conjured up a dismal and dull expectation. The set was bland and uninspiring. The ‘Snowflakes’, whose costumes should be shimmering and glittering, instead were lackluster and bland and therefore failed to capture the wonder and enchantment of this scene. The choreography was fine, with some good dancing, but the lines were irregular, the dancer’s arms were not in unison and a few slips made it look like a cold and bleak winter’s day indeed. As the ‘Snow Fairy’, Amber Scott was secure, strong and confident. She led her attendants and the Snowflakes with authority and assurance. The ‘Winds’ were untidy, messy throughout, their wigs looked so very out of place, and although it was somewhat ambitious, the 360 rivoltade sadly did not work. Astride a giant goose, Eastoe took to the air in one of the few breathtaking scenes throughout the entire ballet. Arriving in the ‘Kingdom of Sweets’, sadly once again, one was disappointed with the set and backcloth, which reminded me of an obscure painting that didn’t quite fit in. The divertissements in Act 2 were as varied as licorice allsorts as the dancers attempted to portray their roles and ignite some passion back into to the ballet. Laura Tong looked out of place against the dynamic duo in Jackson and Daniel Gaudiello. The lads were fiery and feisty with fantastic style and panache. In contrast, Tong looked too tall against the boys, and her costume, apart from being dull and dreary made her appear slightly kyphotic. Robyn Hendricks as the ‘Arabian’ was breathtaking. Her supple body, divine legs and feet were a joy to behold as was her eye line and her haughty manner. Her attendants’ bodies and costumes were striking, but they were so out of time and sync with the simple opening walk that it put me on edge the whole time. I have seen some good versions of the Chinese dance, but despondently, this was not one of them. The costume was plain and boring as was the repetitive choreography (too many double retire sauté and Cossack jumps to second). The three Russian dancers were also bland and monotonous. With the mishaps that occurred on the night the lads did not appear well cast at all (again too many Cossack jumps which appeared to be the theme of the night). I think the music may have contributed, as it was slow, uninspiring and rather drawn-out. It also lacked the energy and excitement that one has come to expect from this piece. In the ‘Mirlitons’, Reiko Hombo looked so out of place height wise it was hard to fathom this casting, nevertheless, of all the divertissements, they were as a group far superior to the others. They also had wonderful tutus, impeccable line and unison, fantastic musicality and stunning faces that truly lit up the stage. Madeleine Eastoe joined in with some of the divertissements, which again highlighted her incredible ability, and like a young schoolchild she was inspired to dance by those around her. Her entrechat six’s were astonishing and I am sure the envy of many females and males alike! In the ‘Waltz of the Flowers’ Lana Jones was simply astounding. A flawless technique, wonderful musicality, impeccable balance, glorious legs and articulate feet emphasizing her lovely line all accumulated to exalt her role as the ‘Rose Fairy’ to an elite level. She was ably assisted by her four Consorts (Killion, King-Wall, Davis and Hawkes) who individually and as a group danced with princely attributes. Her leading Flowers also supported Jones in a very well performed Waltz. The grand pas de deux saw the ‘Sugar Plum Fairy’, Lucinda Dunn, demonstrate why she is one of Australia’s leading principal females. Although her partner Adam Bull was at the opposite end of the height scale, they both danced with nobility and the graciousness of the pure artists that they are. Wearing wonderful costumes, the pair invited us into the true essence of the Nutcracker spirit. Although the pas de deux was performed well, it did however lack some of the excitement and dynamics in choreography as the music built up to crescendo. The reverse fish ended up being horizontal and Dunn needed to be tilted down for correct effect. Adam’s variation was fantastic. His double sissonne en tournant was sharp and crisp, and although his beats weren’t great, his lovely stretched line and extended jetés, along with impeccable musicality, demonstrated his extraordinary ability as one of Australia’s leading men. Lucinda Dunn’s Sugar Plum variation was simply charming and pure in musicality, dainty and graceful. Her gargouillade showed correct rond de jambe with the first leg and all was executed with obvious ease and confidence. The Australian Ballet has some truly extraordinary dancers with so much to recommend. From the elite principals down to eager talented corps de ballet, their obvious ability was demonstrated in the performance. However, with a few odd moments here and there, this Nutcracker was not without its hiccups. I am sure that this will all be corrected for future performances. Wright’s production, for me, didn’t have the intrigue and wonderment I wanted. It simply was not grand enough, especially with the costumes and sets. Sadly, the audience agreed as raucous applause of approval throughout the ballet did not exist. I was in the theatre for opening night in Melbourne, and forgive me for thinking you must have been deaf to the audience. There were plenty of “oohs and aahs” from the moment the curtain went up. Juliet Burnett was indeed beautiful as Columbine, I could see the Snowflakes’ costumes sparkle from the balcony, and you forgot to mention that Laura Tong was dancing the Spanish dance with Kevin Jackson and Daniel Gaudiello. Melbourne audiences rarely (in my 34 years of experience watching ballet in Melbourne) offer “raucous applause of approval”: it’s only Sydney audiences (again in my limited 34 years of experience) who do so. You’ve not mentioned any of the loud bangs whenever foot touched stage, nor the actual slips and falls that occurred: the floor laid for this production is not the usual one, as the sets are too heavy for that. The floor used was not sprung, hence the noise, and the surface was older than desirable, hence the slips and falls. I saw five performances of this “Nutcracker”, with four different casts, so feel qualified to comment that your review based on one performance only is under-informed.